Are you tried? I am. Are you wondering if you're going to make it? Through the day? The week? Until September? Gosh, sometimes I wonder if I'm going to make it out at all. I often picture myself, in 15 years or so, looking a bit like a mad scientist...beady eyes, crazy hair standing on end, a little on edge wondering what wild thing is going to happen next. This summer vacation stuff is NOT for the faint of heart. It feels like we've been going from morning till night, non-stop-- ice cream and carnivals, sleepovers and picnics, swim lesson and Vacation Bible School, swimming and crafts, bike rides and berry picking. It's all good, good stuff, and the truth is that I love doing a lot of it. I suppose if there were 30 hours in each day I'd be coping better. The reality is that I have mommy things to do (and sometimes things I'd just like to do) that just never get done; I don't mean to sound selfish here, but I'd like to read a book (the entire thing! ), do some laundry, and try to keep the house from looking like a tornado touched down...again. Also, if your kids are anything like mine, there is the daily bickering about things "not being fair", or sisters instigating each other until someone is shrieking for me to intercept, or in tears. There is griping about chores, and whining about going to bed. There are wet towels and suits left precariously around the house, no matter how many times I holler about picking them up. There is the feeling of always, ALWAYS, always being in the kitchen to make a meal, clean up after a meal, or manage the snack consumption in-between meals. There was also this conversation, while we were running late for a swimming playdate with friends-- despite trying to keep everyone moving in the right direction, finding goggles, suits, towels, throwing sandwiches together, etc. "Ava, I'm just going to run upstairs to change (because mommy can't go to a swim date in pajamas) Could you please make sure Aubrey gets her shoes on and would you mind cutting that cucumber for me?" Except, what I found when I came downstairs six minutes later, was Aubrey laying flat across the keyboard (trying to play with her entire body, I presume? ), Ella attempting kick overs and Ava dancing, eyes closed, to a song on the I-pad, while the dog was running circles around everyone, barking. I know there is this idea about there about "being in the moment", but seriously?! "What are you guys doing?" I holler. Loudly. They all look at me like I'm really mean and have two heads. "Awww, mom, but I wanted to finish my kick over," Ella says with saddest, poutiest face known to man. "Ava, did you cut the cucumber for me?" "Oh my gosh, you guys! Get in the car, NOW! We're already 15 minutes late." The conversations ensues in the car when I start to go on and on, and on, about how I used to be a really, really nice, CALM, patient, easy going person who was fun to be around. "So..." Ella interjects. "You're saying it's our fault?" Oh mercy, I think. No one prepared me for ANY of this. And, the reality is, nobody does. Motherhood is a tough, tough job. Some days I feel like the worst version of myself imaginable- not because I'm a bad person. In all honesty, and by the grace of God, I feel like I'm trying really hard to be a good person. A kind and compassionate person. An empathetic, intentional, encouraging person. A faithful, Godly person. But, somedays I feel like I'm surrounded by utter chaos. Let's be real, it can be challenging to live in chaos for long stretches of time...like a decade, or so. Give or take a few days. To be fair, I'm a highly sensitive person who is keenly sensitive to stimuli. I don't say that lightly. If you've never read about HSP's (highly sensitive people), it's a real classification, with a compelling body of reasearch. It's part of what makes me creative- the noticing of EVERYTHING-but, it also feels like my kryptonite in this land of motherhood. A land chock full of perpetual stimulation, needs, crises, responsibility and noise. All that to say, tired momma, whether you're highly sensitive or not, this is no easy gig. I'm here to remind you that you're doing a really good job! You're most likely pouring out all of yourself to love your children in the very best way you can, despite feeling like you're failing. You're not failing, I assure you. Your kids will remember this all in a new light someday when they are parents (just as we have! ), and think "Whoa! This is why mom seemed a little crazy on that day in the middle of July when we were all acting like drunk monkeys!" They'll have a LOT of grace for you then. I have a lot of grace for you now. We need to have grace for ourselves in the process. 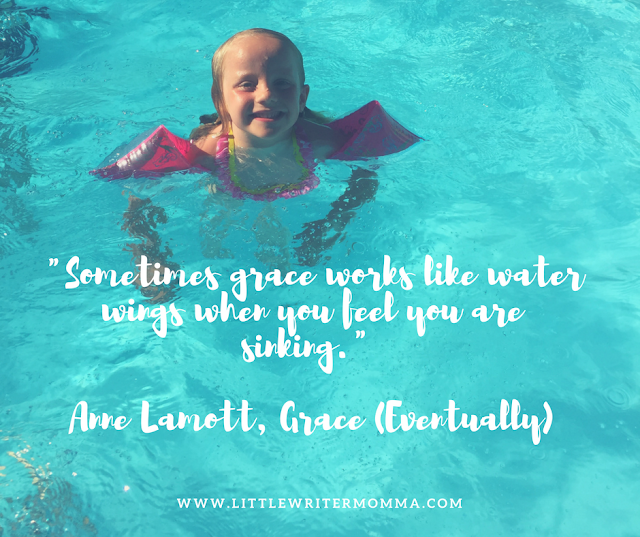 "Sometimes grace works like water wings when you feel you are sinking." Grace is a beautiful thing. I'm reminded of our inspiration for giving our third daughter her middle name, "If we're going to have a third girl," I reasoned, "we are going to need a LOT of grace!" And so, Aubrey Grace Littlewood came to be. In Grace (Eventually) Lammott also says, "You can get that monkey off your back, but the circus never leaves town." If that doesn't describe motherhood with young children in the middle of summer vacation, I'm not sure what does. Here's to the circus fellow mommas! Let's step out to the concession stand for a minute, buy some popcorn and nachos, and try to gracefully enjoy every minute (alright, as many of them as we can!) of this wild ride called motherhood, with our pink water wings on! P.S. Next week I'll be posting a few tips and favorite quotes about staying in the moment...Please stop back!